Many of you may already have a digital camera system and a proper underwater housing. As such, it’s likely you are asking yourself how to take better pictures. Now a structured program is available to answer your digital underwater photography questions which means more fun and satisfaction in diving.The DIGITAL UNDERWATER PHOTOGRAPHY Program can be learned in the pool/confined water or directly in the open water. 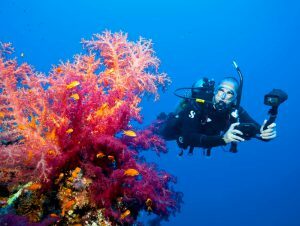 This makes this a perfect “winter specialty” which can be done just before your diving holiday starts.